As worm farmers, we generally learn to keep worms healthy through the joys and horrors of trial and error. We read up and study just how to create ideal conditions then do our best to provide them. But let’s get real; life has a nasty way of hitting us with surprise tests that teach us the things books don’t ever seem to cover. With bare-bones equipment, a mail-order batch of worms, and all the confidence of a young go-getter, I began my worm composting days all too ripe for the painful lessons of unforeseen trials. It was years ago, before we had worm composting websites and blogs to turn to, when in my eagerness to nurture my red wigglers, I accidentally over-indulged them and created a disastrous mess. I was thrown for a complete loop. Imagine laying out a bountiful spread of choice foods for a holiday party at your house, and the next day half your guests end up sick in bed with food poisoning. Mine wasn’t an overnight experience, but it was shocking nonetheless. I had given what I thought was a generous offering of holiday meal kitchen scraps for my worms to enjoy. Instead of turning it into “black gold,” they didn’t finish most of what I provided and got very sick. I was about to learn a very crucial lesson. I’m a self-described member of the Clean Plate Club. I must have expected them to be as well. It was drilled into my head from a very young age that what food is served must be eaten before leaving the table. I guess my worms didn’t get the memo, or rather; I overlooked that composting worms need only eat what they can digest and anything else is likely to rot- whether they’ve consumed it or not. What I thought would be a delicious feast unwittingly created a toxic environment that lead to a shocking, and literally sickening, phenomenon known as protein poisoning. If your worms are deformed, discolored, or dismembered there is a high likelihood that you too may have a protein poisoning on your hands. Bear in mind that other factors may have similarly devastating effects, such as the quick onset of a cold spell. I admit that originally, I had blamed the late December arctic blast for the torture my worms endured. If you’ve had a recent cold snap when your worms take a turn for the worst, consider temperature a possible cause, but learn from my mistakes and don’t jump to any conclusions. Any recent change from the norm is worth looking into no matter how harmless it may seem. Either way, I’ll help you identify the things that lead me to diagnose a case of protein poisoning in my worms and teach you how to remedy the situation quickly. I was stumped and felt like a failure for somehow letting my worms be subject to what I figured was some kind of natural disaster… but in my home!? It just didn’t add up. I wasn’t satisfied with the story in my head so I hopped on the computer, just like you did. I had little to go on besides symptoms, but my search for answers quickly revealed exactly where I had gone wrong. As I began to put the pieces together it became clear that I was describing the conditions of what some people would term protein poisoning. I slowly learned, however, that it often went by two other names as well: sour crop and string-of-pearls. Sour crop gets its name from the way this condition comes about. If the food in your worm bin isn’t eaten and has inadequate oxygen it begins to decay through fermentation. The worms’ food becomes “sour” and the surrounding air becomes toxic. Basically, you’ll know when it’s happening because it’s going to smell funky up in there. So, the actual poisoning is a result of living in the acidic environment and consuming the rotting food that creates it. That funky stench was my first clue that maybe winter’s cold wasn’t what bothered my worms. String-of-pearls, on the other hand, is a deceptively quaint name given to this disease because of the symptoms your worms may exhibit. When a worm is afflicted by protein poisoning they sometimes have bloated segments alternating with squeezed or narrowed sections in between. The resulting pattern is characteristic of a string of beads or pearls- but trust me, not a pretty one. There it was, clue #2. Read on to learn how to avoid the causes of this gruesome affliction and how to remedy the situation once you notice the symptoms. In my search, I learned that protein poisoning is a direct result of overfeeding. Doh! Three in a row! The problem in my bin had to be protein poisoning. Once I figured it out I just had to own up to my mistake. I was a noob…. I didn’t know what I was doing and fed my red wigglers too much. As worms eat, enzymes are introduced within the gizzard to digest relatively large but partially decomposed particles of food. These enzymes effectively make food suitable for absorption. The gizzards of my poor overfed composting worms couldn’t maintain an adequate supply of the enzymes needed to accommodate the volume of undecomposed food passing through. They sucked up whatever food they could, totally unaware that they wouldn’t be able to properly break it down. Inside the worms, the slurped up food decomposed. Decomposition formed gas which became trapped in their intestines. There, the gasses expanded and created air-filled pockets which eventually burst or otherwise harmed them. My head is hung in shame just writing this. That lesson was a rough one to learn, though I’m glad to be through it and there is a silver lining. Now I can to teach other people like you how to avoid making the same mistake in your own worm bin. Allowing (pH conditions in my worm bin) to become acidic by overfeeding was like asking for protein poisoning by name. I learned to refrain from adding too much food in general and particularly to avoid grains such as wheat, rice, barley, or corn-based product which tend to easily become spoiled and sour the bedding. Other culprits to avoid include citrus fruits and large quantities of coffee grounds which are acidic in and of themselves. If in fact, you have come to this blog as a result of a search to discover and remedy the cause of your ill-fated worms condition- I have good news. We are here to help. Now that you have learned the name for this horrific phenomenon and discovered what may cause these conditions to develop, we will teach you how to save your remaining worms and prevent this from ever happening again. Unfortunately, our delicate red wigglers, once poisoned, cannot be cured. More often than not, a worm with sour crop will perish. I’d say more than 90% of my worms got away scot-free but that’s only because I got right down to business when I noticed something going awry. When you notice that something’s up in your worm bin your best bet is to rescue the rest of the population ASAP. Of course, starting a completely new bin using healthy survivors as your base crop is one of the best ways to offer your worms a chance at survival. But, that is not always an option. If you don’t have the ability to start a new bin from scratch, try the steps below. Time is of the essence here folks. The very air your worms are breathing is part of the problem, so your initial response needs to get some clean air to your worms. Completely uncover the worm bin and gently aerate the bedding by lifting and turning it. Searching for worm corpses may just have been how I allowed fresh air to replace what was toxic that day. Now that you’ve literally cleared the air, you can work to successfully save your remaining worms by removing the acidifying culprits. If there is uneaten food fermenting in the bin, throw it away, far, far, away. Pickled vegetables may be good for a crudité but not in your worm bin. Entirely replace the acidic bedding, or at the very least add to what exists with fresh dry brown materials such as shredded paper, leaves, cardboard or peat. This will help to disperse the concentrated levels of acid found in the original bedding, making the entire bin more hospitable for your worms. Supplement bedding and feedings with some pulverized eggshells, oyster shells, or moistened limestone or calcium carbonate to buffer the pH to a more neutral level. These measures can quickly reverse the direction of things and have your worms back on track in no time. These days, pulverized eggshells are a regular component in the blended mix I feed my red wigglers. How Do I Prevent Protein Poisoning? Once you start getting things under control, you need to switch your focus to preventing this from happening again. Offer your red wigglers a period of transition without feedings so they can clear their systems of whatever toxic materials may remain. Then follow these next tips to ensure that you’ll never find a string-of-pearls among your precious compost worms again. Let your worms dictate their feeding schedule. Feed them only as they are finishing up their last meal. Regularly test the pH of the worm’s bedding. Consider using a blender to make the food more readily consumable. Adding eggshells or limestone powder to the mix will help your bin maintain a neutral pH. Gently aerate your compost weekly to ensure a good oxygen exchange. Cure the food you supply your worms by allowing it to sit a couple days in a mixture of “finished” compost so that it can begin its decomposition before being served. Now you are equipped with everything you need to avoid a protein poisoning crisis. You’ve learned all there is to know about sour crop and how to save your worms from its devastating effects. 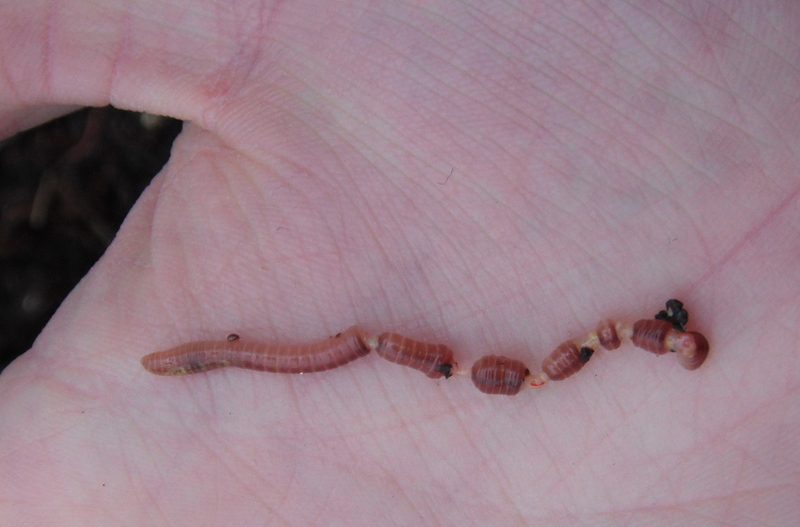 If you follow our guidelines you should expect never to find a string-of-pearls situation in your worm’s bin. At this point, there is only one thing left to do. Sign up for our FREE newsletter for more expert worm composting knowledge from The Squirm Firm! We will only send you one email per month, so you don’t need to worry about clogging up your inbox! Best of luck with your worm composting project! Fear not, exploring the bin and returning to the bedding is a common and harmless adventure for the red wiggler. Learn more about when exploring is a sign of danger in WORMS RUNNING AWAY? STOP THE ESCAPE BEFORE IT’S TOO LATE!http://thesquirmfirm.com/worms-running-away-stop-the-escape/#comment-1946. Feeding them an adequate amount of food once a week can also be part of a safe and healthy way to maintain your worm bin. Worms in my bin keep coming up to the surface. I only put egg shell in their grinded vegetable. Their bedding is coco peat. After reading yr article, I spread egg shells on the bedding surface. Now they are all inside the bedding. Is that correct reactions from them? I am a large scale worm farmer from Australia, specialising in producing large numbers of a variety of different worms. I have been working with worms for over 25 years. I have read many posts about protein poisoning over the years and have been uncomfortable with all of them. Mainly because the discussions have focused on causal factors that do not match with observations. Up until now, I have chosen not to comment on these seeming anomalies, but since you have written so well and observed similar anomalies and have had your information spread by others, I thought it appropriate to comment. Your own observation that protein poisoning can be caused by a dramatic change in temperature means that the cause of protein poisoning is not just food related. Through my own observations where I have seen protein poisoning occur in highly alkaline bedding without overfeeding, makes the acid formation causation of protein poisoning seem unlikely. From my observations I believe the more likely cause of protein poisoning is the death or rapid change in the micro-organisms or biomass of the worm bin. The dying or stressed biomass leads to the formation of toxic gases (such as ammonia and alcohol vapours) which are then inhaled or absorbed through the worms skin, leading to various symptoms you describe, being discolouration of worms, swelling of worms and of course string of pearls. My theory is only just that, a theory. But I find it fits neater with the all of the varied observations leading to worm deaths. Your solutions still make sense and are valid, but adding lime or eggshells will not always work and in some instances may be detrimental if ones worm bedding is already too alkaline. Thanx for the informative blog and I hope I may have added some food for thought. I completely agree with you that the current theory is wrong, though I have no idea what could explain it. I have protein poisoning right now, in an alkaline setup and a minimum of food.